On our previous post, we’ve tackled that fresh fruits are healthy and nutritious and are definitely Paleo. One can ensure overall health when fresh fruits and vegetables are abundant in is diet. Fruits can lower the risk of certain serious chronic diseases. Apple in particular is beneficial when consumed regularly. Apples are often eaten raw including the skin. Apples have been an important ingredient in many desserts like pies and cakes. As the saying goes, “An apple a day, keeps the doctor away!” Apple is rich in energy-producing nutrients, vitamins, minerals and antioxidants. Apples are low in sugar, no salt and contain vitamins A and C and significant dietary fiber called pectin. Pectin is a soluble, fermentable fiber that gives apple its huge list of benefits. Apple also provides B vitamins such as folate which is critical for fetal and children development. Apples offer essential minerals including calcium, iron, magnesium and phosphorus. Apple is one of the most fulfilling foods to eat. Just an apple can make you feel full that you will involuntarily eat less of other foods. This can help in maintaining and controlling weight. The apple peels contain phytonutrients like quercetin and flavanoids which can slow digestion, prevent sugar spike and can lower the risk of some types of cancer. Quercetin is a powerful antioxidant that can protect brain cells from degeneration which in turn can fight Alzheimer’s disease. It can also boost your immune system. Pectin in apples can aid in preventing cholesterol build up in the lining of the blood vessels thus lowering the risk of atherosclerosis and heart diseases. 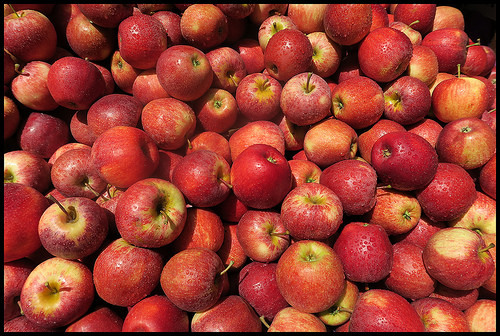 Apple is rich in insoluble fiber and water which cleanses and moves food quickly through the digestive system. It also slows down the entry of glucose into the bloodstream hence decreasing the risk of Type II diabetes. Fiber in apple can prevent diarrhea and constipation. It can also prevent haemorrhoids which are caused by too much pressure in the pelvic and rectal areas. Apples are known to be prone to worms and other insects and so most apples available in the market have been treated with pesticides like diphenylamine (DPA). DPA does not kill insects but prevent fruits from developing black or brown patches. Exposure to DPA has shown to increase risk of birth defects, respiratory illnesses and even cancer. Make sure to get the freshest apples available and the ones that are organic or at least those that are not sprayed with pesticides. Moreover, apples are acidic and its juice may damage tooth enamel when eaten very slowly. It is advisable to rinse the mouth with water to help away the acids and sugars after eating an apple. Like any other foods, excessive consumption of apple can have side effects. Because most of the nutrients from apples are in the form of carbohydrates, it can contribute to weight gain. Click here to see what other fruits are good and bad from a Paleo perspective. What Experts Say About Apples.. Is It Paleo? Chris Kresser. Ask Chris: Is Fructose Really That Bad? Outside Live Bravely. Are Apples A Health Risk?